Arrive at Delhi Airport.meet by our representative escorts you to the pre-booked hotel for staying overnight. Post breakfast, leave for a long tour through the capital city. Start with the beautiful Laxmi Narayan Temple and proceed to India Gate, a cenotaph commemorating Indian martyrs, Parliament House, Rashtrapati Bhavan and Jama Masjid, India's largest mosque. Visit the towering Qutab Minar, historical Purana Quila, Humayun's Tomb and Jantar Mantar observatory. Pay homage at Raj Ghat, Mahatma Gandhi's memorial. Later, witness the vivacious Sound & Light Show at Red Fort, a striking beauty in red sandstone. Return to hotel for overnight stay. Early morning, leave for Agra by road (4 hours). Halt at Sikandara en route for a brief visit. Reach Agra and proceed to the hotel for overnight stay. Leave for sightseeing tour through the beautiful Mughal city. Be amazed at the incredible beauty of Taj Mahal, a white mausoleum, one of the world's seven wonders. Built in pristine white marble by Mughal Emperor Shah Jahan in remembrance of his beloved wife Mumtaz Mahal, it is thronged by tourists from far and wide. Later, proceed to the imposing Agra Fort and Itmad-ud-Daula's Tomb whose design elephants even outshine the Taj! Shop around for exclusive specialties at the Local Bazaar and transfer to hotel for night stay. Early morning drive to Jaipur. On the way, halt at Fatehpur Sikri (5 hours) and tour the sandstone city of Emperor Akbar. Cover Jama Masjid, Buland Darwaza, world's largest gateway, the historical Palace of Jodha Bai, Birbal Bhavan and Panch Mahal. Proceed towards Jaipur. After arriving, check into a city hotel. Later, leave for sightseeing covering the City Palace flanked by courtyards, lush gardens and monuments, the unique Royal Jantar Mantar Observatory, Nawab Sahab Ki Haveli and the Local Bazaar. Return to hotel for staying overnight. 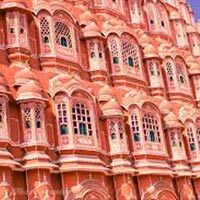 Leave for a full day guided tour through Pink City after breakfast. Witness the striking beauty of Amber Fort while enjoying a joyride on elephant back. Be awed at the perfect blend of Rajasthani and Mughal architecture in the palace fortress. 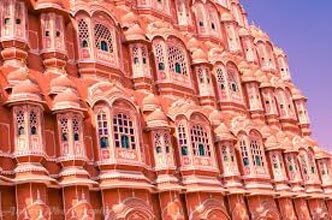 Later, visit Hawa Mahal or Palace of Winds, the stunning five-storied pyramid-shaped palace with numerous small windows and screens. Transfer to hotel for overnight stay. Early morning, start your road journey towards Delhi. After arriving, head straight to the airport/railway station to board the onward flight/train. Indian Holiday offers online reservation for Golden Triangle Tour and other Tour Packages for North India. For bookings, or for more information, please fill up the form.